The Best Science Fiction of the Year Volume 4 will be published by Skyhorse/Start under their Night Shade Books imprint in early 2019. I am presently considering all science fiction stories (short stories, novelettes, and novellas) originally published in English in 2018. (Translations are allowed as long as their first English language appearance is in 2018.) To keep things simple, I will be using the publisher’s copyright, magazine’s cover date, or posting date (primarily for online fiction) to determine eligibility. Serialized works will be considered published at the time of the final installment. Magazines: Analog, Apex, Asimov’s, Clarkesworld, Cosmic Roots and Eldritch Shores, Diabolical Plots, F&SF, Fiction River, Galaxy’s Edge, Interzone, Lightspeed, Longshot Island, Mithila Review, Mythic Delirium, Shoreline of Infinity, Strange Horizons, Tor.com, and Uncanny. So very honored to be a finalist for Best Editor Short Form again this year. This is my sixth nomination in this category–no wins–and every time has been as much a thrill as the others. Always and amazing group of colleagues competing in this category. 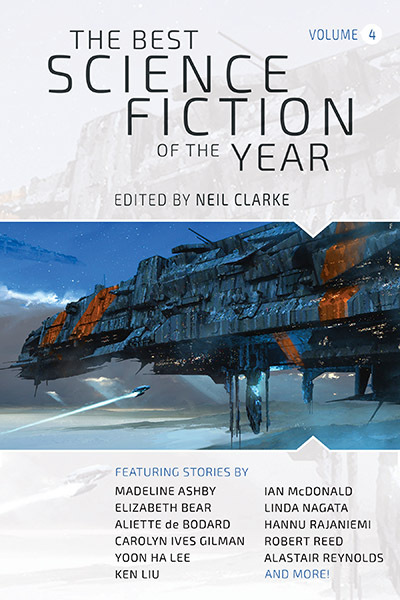 Also very happy to see “The Secret Life of Bots,” by Suzanne Palmer (Clarkesworld, September 2017) and “A Series of Steaks,” by Vina Jie-Min Prasad (Clarkesworld, January 2017) competing for the Hugo Award for Best Novelette and Vina among the John W. Campbell Award for Best New Writer finalists. I included both of these stories in my latest Best Science Fiction of the Year anthology–and Vina as best new writer–so it’s nice to see others agreeing with me. A big thank you to all the people who nominated this year. I appreciate your support and hope to see some of you at Worldcon this summer!